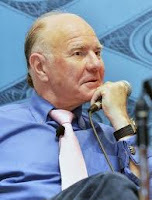 Marc Faber : In my view the global economy isn't growing much, as is evident from the sales report of McDonald's, Caterpillar,"
"The market is a discounting mechanism. It has already discounted QE unlimited. The impact of continuous monetary easing is diminishing "